There are many reasons and occasions to give a gift to a firefighter. The type of gift that suits the situation will depend on the occasion and your relationship to the firefighter. 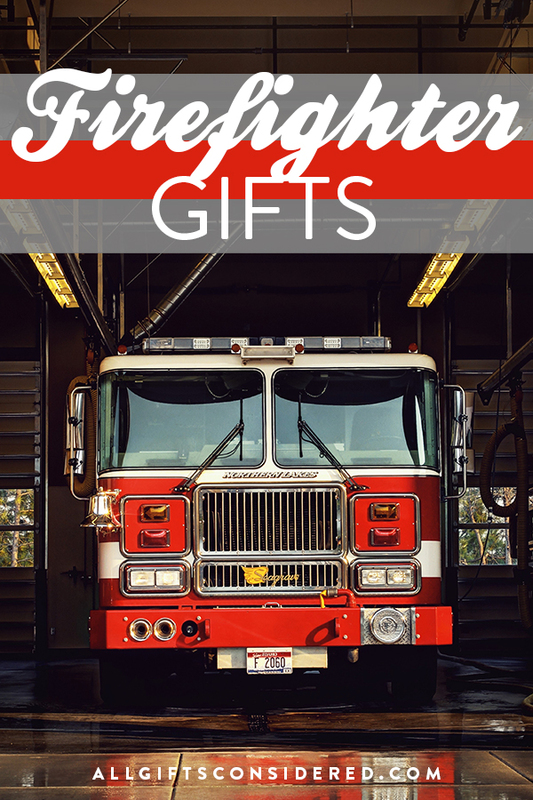 Gift Ideas for Firefighters: These are gifts you would give a fire fighter that you know personally for a birthday or Christmas gift. Fun Gifts for the Fire Station: Here are decorative and useful items that will be appreciated by any and all who hang around the station. Thank-You Gifts: If you have been helped by a firefighter, this is a list of appropriate gifts you can drop off at the fire station to express your gratitude. 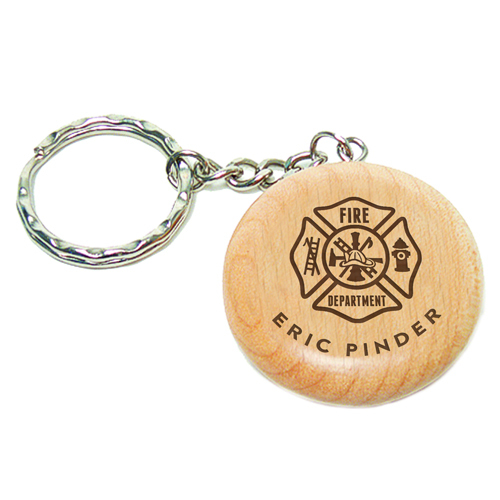 Keepsake & Promotional Gifts: Here are some creative and customized gifts that a fire chief or city council might give to the entire crew of volunteer and/or professional firefighters for holidays or other special occasions, or to help promote the fire department to the general public. 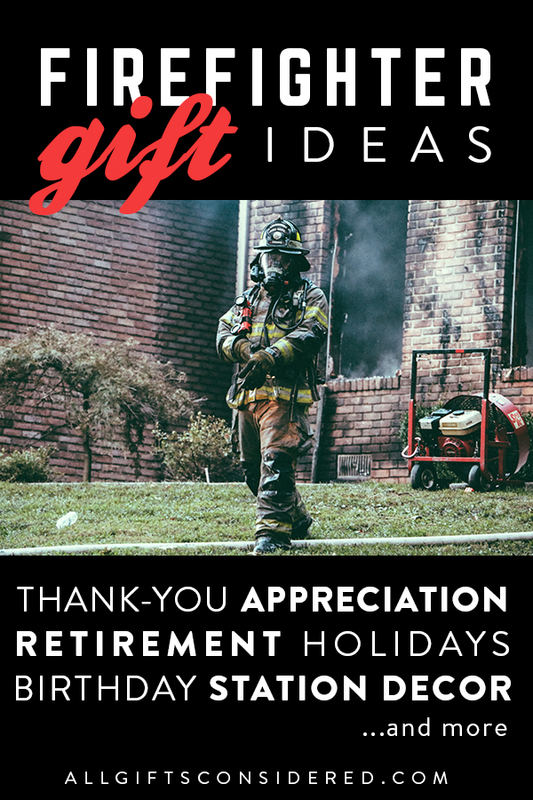 Commemorative & Retirement Gifts: These gift ideas are ideal to celebrate career achievements, longtime service, or the retirement of a lifelong firefighter. Please note that this post contains affiliate links, which means that if you purchase an item after clicking on one of our links, we will get a commission at no additional cost to you. See more details in our disclosure here. These are more personal gifts you would give a firefighter in your family or someone you know personally. These are ideal for birthday and Christmas gifts. This beauty is handcrafted in Oregon from solid wood. Gorgeous engraved text (all of which can be customized) in a timeless yet contemporary design, this fire fighter plaque is sure to please. Available in two sizes, each which can include an optional hanging personalized name board plaque. 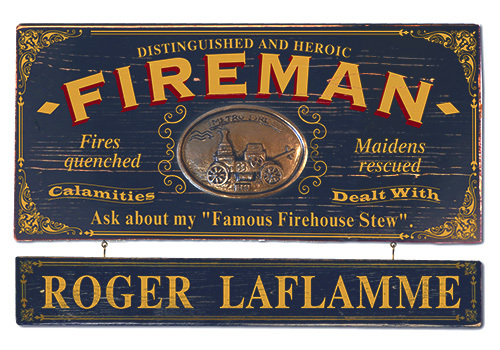 This wooden Fireman sign is made in the USA and silkscreened with a fun vintage fire fighter design. 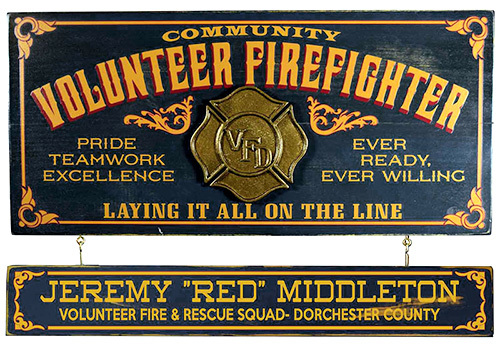 Perfect for the “distinguished and heroic” fireman, you can add a customized hanging nameboard in matching antique style to personalized this gift idea. Here’s one for the hardworking community volunteer firefighter. 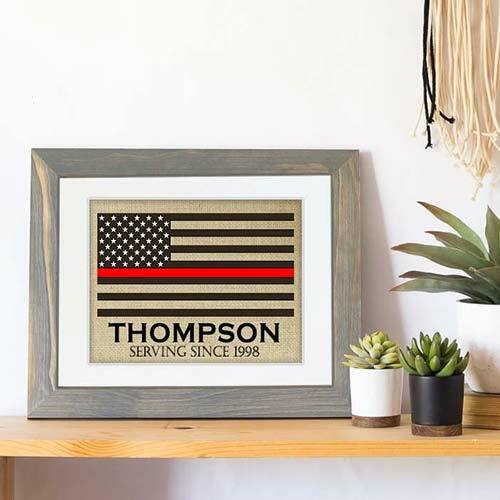 Emphasizing “pride, teamwork, and excellence,” this is a wonderful personalized gift idea for the fire fighting volunteer with a servant’s heart who is always ready to lay it all on the line. 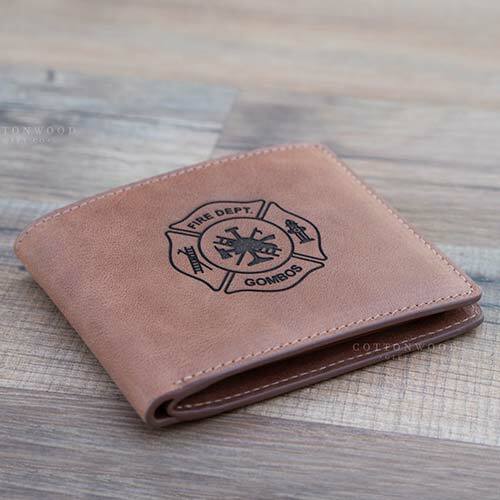 Genuine leather cowhide wallet, made in the USA and custom engraved with the classic fire department shield and optional custom message on the inside of the wallet. The “Maltese Cross” shield includes personalization of a name across the bottom and, optionally, an engine or badge number in the center. Add a personal note etched on the inside of the wallet and you have created a durable, beautiful, handcrafted, and personalized fireman gift that will last a lifetime. 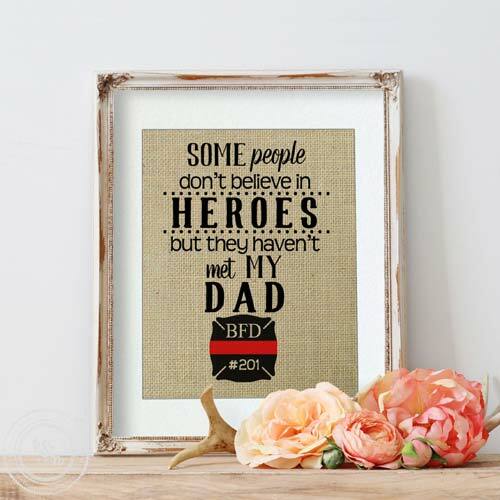 Creative burlap art print poster that reads, “Some people don’t believe in heroes but they haven’t met my Dad.” Includes personalization of the badge with fire department initials and badge number. The creator also offers a selection of optional frame add-ons that are truly lovely and add a classy finishing touch to the gift. Birch wood fire department shield that COLLECTS ALL THE CAPS. Beer caps, that is. Of course this will probably have to go in your home bar or man cave, but you can still show off your exquisite taste in craft brew while honoring the FD badge. 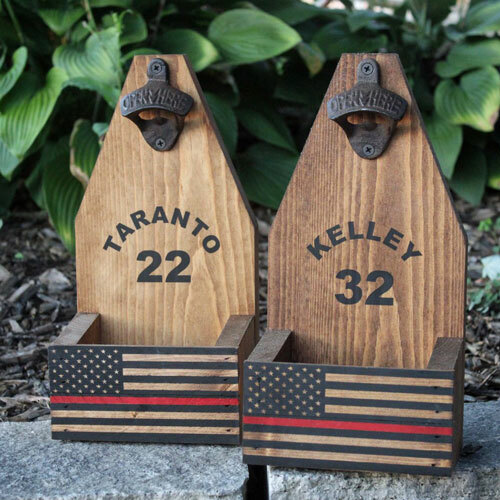 This rustic wooden bottle cap opener can be mounted to a wall and includes personalization of the firefighter’s name and number, plus an American flag with the “thin red line” on the cap-catcher section. Two halves of the same heart. Laser engraved with the Maltese Cross, this is a beautiful and meaningful firefighter gift idea for Valentine’s Day, anniversaries, birthdays, and more. 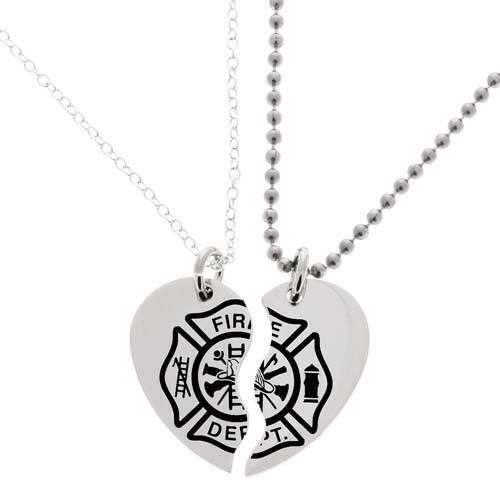 Show your unity and wear it every day with this set of two halves of your fire-fighting heart. 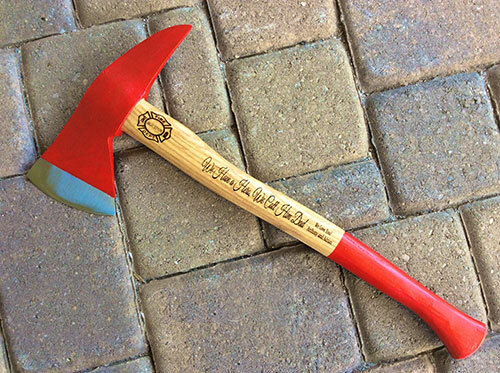 A classic bright red fireman’s hatchet/ax, which includes custom etching on the handle. This makes for a truly meaningful and long-treasured personalized gift. This fun hydrant-shaped pocket knife is also a multi-tool, featuring a strap/seatbelt/rope cutter and glass breaker so that you are fully prepared for emergencies. 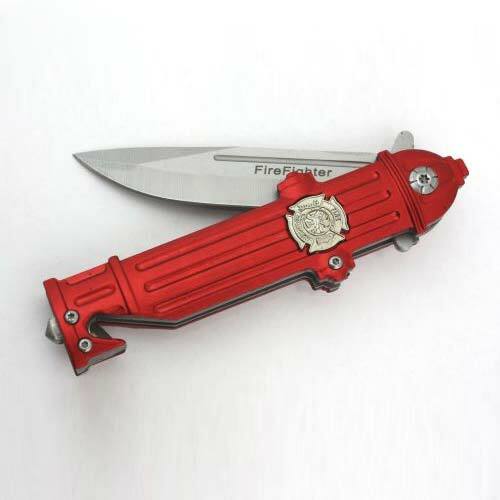 Toss in the fun design and 3″ stainless steel blade, this is a great firefighter stocking stuffer gift idea. 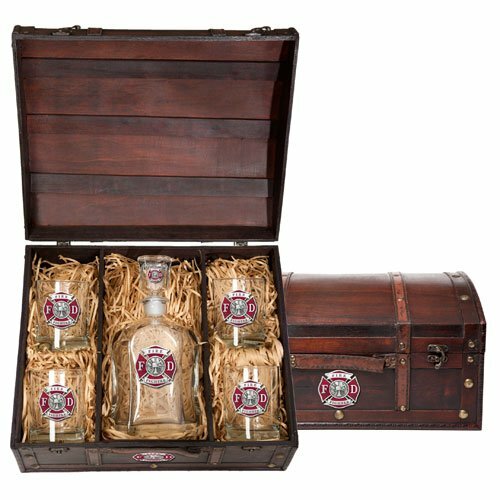 A gorgeous custom-made wooden chest safely stores this heirloom firefighter decanter and glass set. The 24 ounce decanter and four matching 14 ounce glasses are each emblazoned with a cast pewter fire department emblem. Next, we have a few gift ideas for around the station. 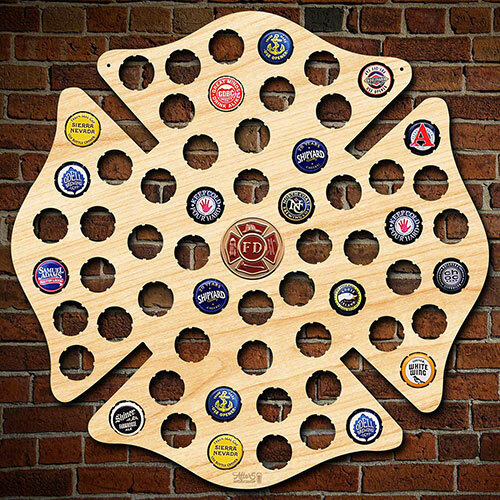 These firefighter gift ideas can be enjoyed by one and all, adding fun, decor, and/or functionality to the fire station. These are useful gift ideas for firefighters giving gifts to one another or for you to provide something special for the whole crew. This handy table-top corn hole set will keep the entire crew occupied during those long, boring shifts at the station. 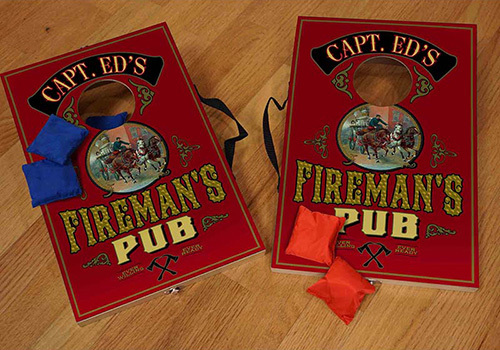 Personalized with your name – or station number – across the top, this “Fireman’s Pub” corn hole game packs up neatly for easy transportation so you can use it at the station, at home, or outside. The vintage design features a old-world horse-drawn fire engine and classic red colors. Includes four red and four blue sand-filled bean bags and free personalization. You’ll want to start a tournament with the entire department! Anyone who loves nature will appreciate a fun fire-fighter-themed bird house. This one is a fireman’s helmet, and you can also get a fire truck, fire hydrant, and more from Spoontiques. This aromatic cedar wood bird feeder is custom engraved with the fire fighter shield and your choice of text. Personalize it with your station name or use as a memorial for a beloved crew member. Personalization options are limitless, so just ask and we will make it happen! This looks like a science experiment gone horribly… perfect. For the true coffee connoisseurs, they will tell you that the only way to truly enjoy great coffee is by the pourover method. 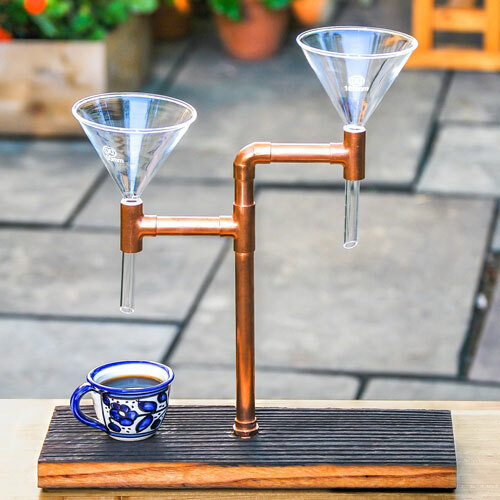 This allows the hot water, poured from above, to soak up every micron of flavor from the grounds, dripping down through the filter and into an awaiting cup below. When firefighters are at the station waiting for the alarm to sound, there is lots to do…. until there isn’t. Once the truck is spotless and all stocked up, once the food has been consumed, once cleaning and maintenance duties are done, once you have completed your exercise routine… there’s pretty much nothing left to do except watch TV or play video games. 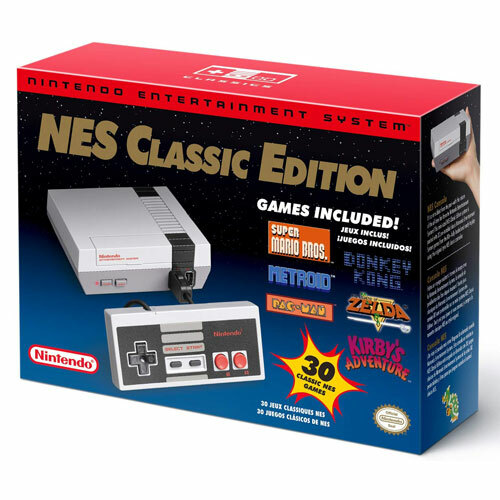 Every station has an Xbox or Playstation or whatever, so you could always spring for some new games for the contemporary systems, but if you want your gift to really stand out as a memorable one, go with the old-school “original” Nintendo. Retro style. Don’t forget to nab some extra wireless controllers. Protect the furniture at home or at the station with a lovely and personalized coaster set. 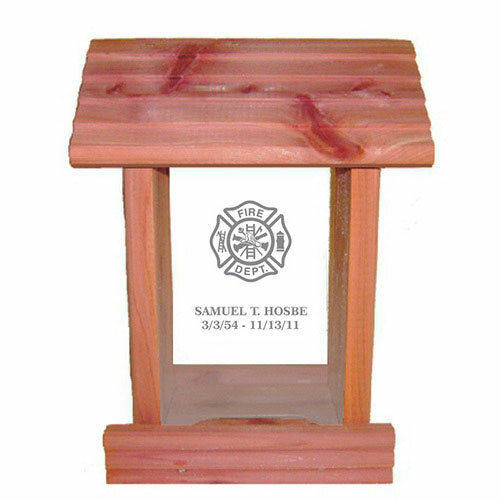 Custom engraved with the initials of your choice in relief, this is a wonderful and oft-used gift idea for a firefighter. Many fire stations and firefighters are not permitted to receive gifts. You may want to call ahead and find out if the fire station has restrictions on purchased or monetary gifts. If there are restrictions, here are some creative firefighter gifts that are usually allowable, or can at least slide in under the radar. Keep in mind that most fire stations have multiple teams. Find out their schedule and make sure you drop off your gift to the right crew. If it is not the same crew (and especially if your gift is edible!) there is a high probability that they will never see the gift. You can always send a thank-you note. This is, in fact, one of the most appreciated gifts a fireman, firewoman, or firefighting crew can receive from the general public. Get a card and write some comments by hand. Mention the day and location of the event and the names of the firefighters involved (if known). Express your appreciation and gratitude, and know that the crew will truly value your note of thanks. There is almost always a way to donate to the fire station, or to a cause that they support. Call and ask about the best way to donate, and they will gladly tell you. Every fire department faces budget and staffing issues that can be traced back to politics. There’s a tug and pull between the elected officials and emergency services that almost never gets fully squared away. Write to your local officials who oversee the department and let them know the firefighting crew is doing a great job, and that you will vote for the politician who supports emergency services. Include a copy of this letter in your thank-you note to the fire station crew. Same as above, but sent to the newspaper so that your comments can be seen publicly. This, too, has an impact on politicians, and the fire crew will appreciate the public commendation. A lovely baked treat is a great way to express your thankfulness to the firefighters. Make sure you make or bring enough for the whole crew. Although many stations do not allow gifts, food can almost always get through. The crew will love it. Bring in a big ol’ bag of delicious coffee for the fire crew to share. Preferably this would be some fancy local roast, and plenty of it. Firefighters love to grill. Bring some quality steaks, a bag of potatoes, and some charcoal. They’ll love you forever. Call ahead for requests, then pick it up and drop it off to them personally. Pizza is a great gift because even if the crew gets called out on a fire, it still tastes amazing as leftovers. 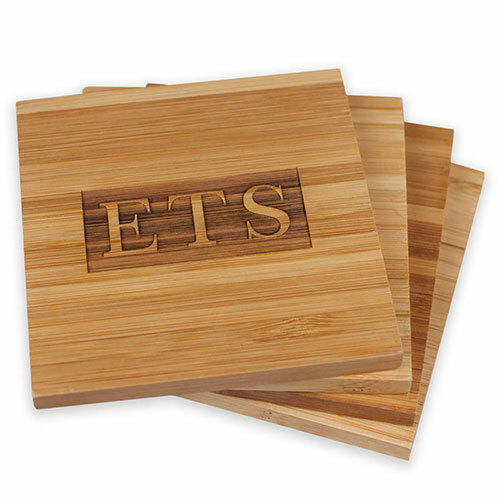 Each of these keepsake and promotional gifts include free custom laser engraving and bulk quantity discounts. Use them to promote the department’s good work, celebrate special station-wide achievements, or provide beautiful year-end, holiday, or commemorative gifts for your fire crew. 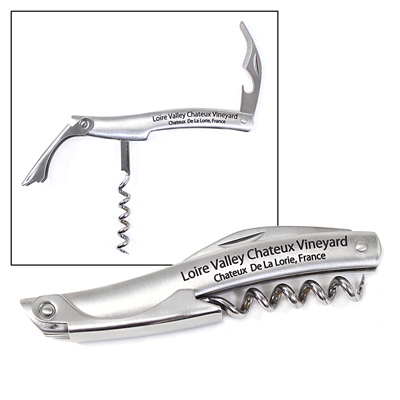 Here is one of our most popular wine gifts – our custom engraved wine opener multi-tool, which boasts durable stainless steel construction, three handy wine (and beer) opening devices, plus laser etching of your department details or names. 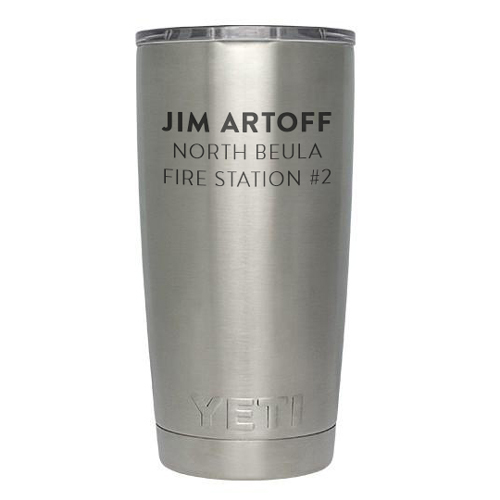 Custom engrave these beautiful and premium-quality YETI tumblers for a great personalized gift your whole department will remember and actually use for years to come. These top-notch travel mugs come in a variety of shapes, sizes, and colors, and include customization plus bulk quantity discounts. Any fire department info or logo can be etched, along with the individual names and numbers for each crew member. Everyone has keys, and everyone likes a nifty personalized fob to add to their keychain. Whether you are labeling the fire engine’s sets of keys, secure equipment storage, or giving as a special personalized gift, these are a great way to promote team spirit. These high-quality bamboo wood pens include custom laser engraving and make a premium gift idea suitable for the whole department. These sturdy carabiners are set apart from the knockoff versions because ours are not printed (which will rub off after any real use). 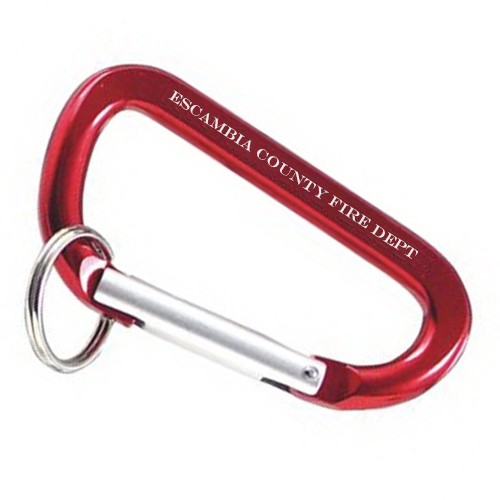 Rather, these are laser etched, permanently marking the carabiner with your department’s info and message. 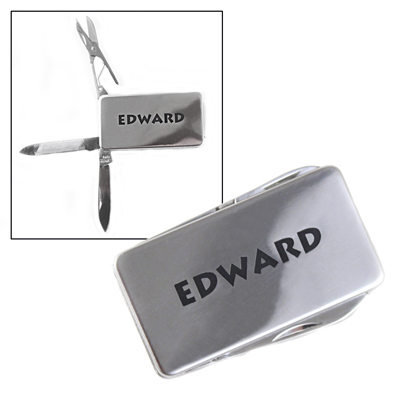 This stainless steel money clip stands out because of the cool multi-tool functionality. 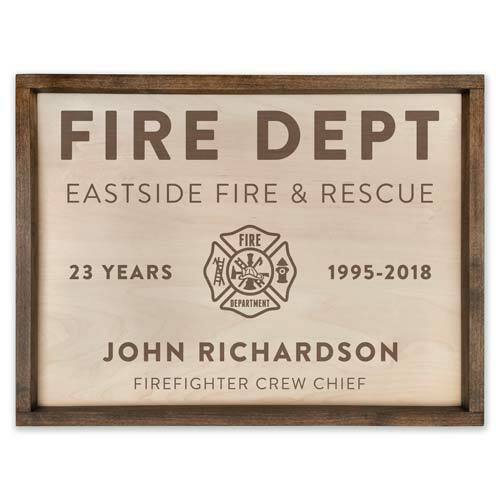 Includes custom etching of your fire department name or station number and the firefighter’s name, should you so desire. 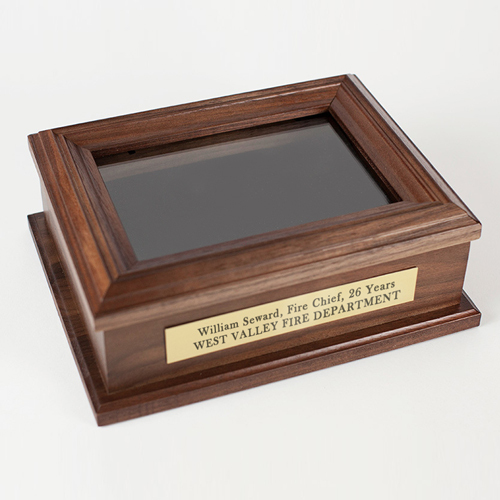 How about this for a firefighter retirement gift: A gorgeous walnut wood keepsake box, made in the USA from actual walnut, with custom engraved name plate on the front and optional etching on the real-glass lid. Truly a classy gift. We already featured this one above, but it’s a classy fireman retirement gift so it warrants a second mention here. The custom name board can actually feature TWO lines of personalization, a name with a smaller line of text below, so use your imagination to create the perfect retirement gift! This lovely fire fighter print uses pigment ink to print on rustic burlap. The design features the USA flag with the center line highlighted – the “Thin Red Line.” Includes personalization of name and date in your choice of format and also print size. Off with your top, you’re retired! 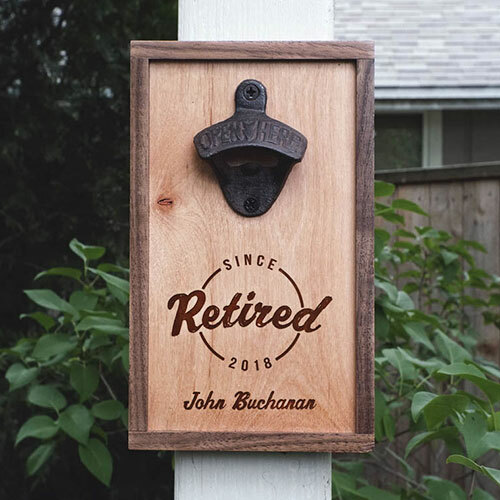 This wooden wall-mounted bottle opener is the perfect gift for the retiring fireman. The fun etching reads, “Retired since [year]” and includes the fire fighter’s name etched below it. You’ll always be ready to open a cold one when your firemen buddies come around! 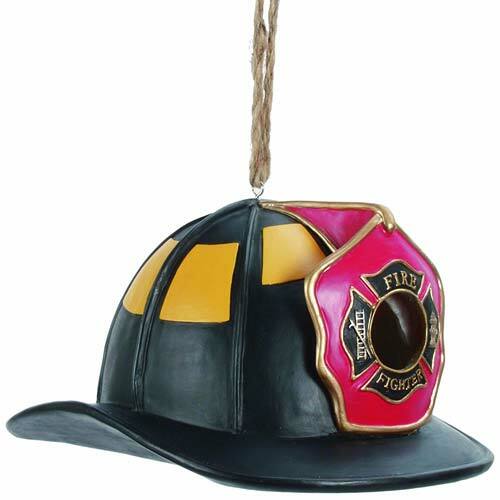 At Northwest Gifts, we offer TONS of firefighter gifts that are truly unique. 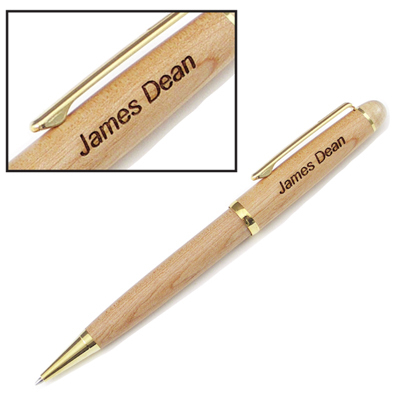 Many of these can be personalized, laser engraved, or custom printed with the name or department info of your choice. We have plaques and promotional stuff with bulk discount rates and creatively custom ideas for retirement or birthday gifts. Browse more ideas at the Northwest Gifts Firefighter Gift Guide.